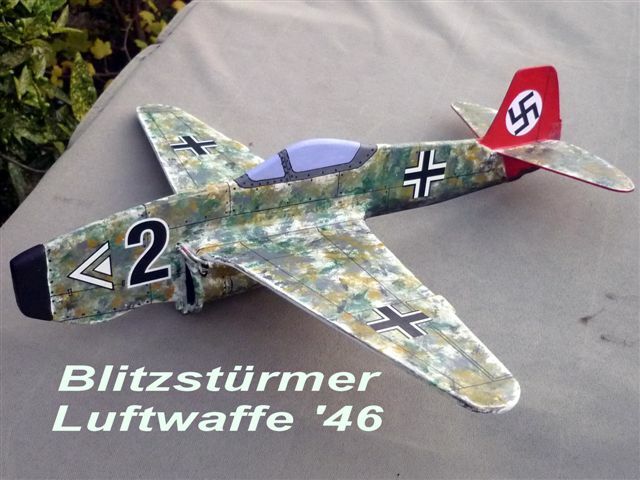 This is my Blitzstürmer, Luftwaffe '46 fantasy version of the much later developed Soviet Yak 29 jet. Blitzstürmer is of all balsa construction and weighs in at 163 grams all up flying weight. Power plant is a standard Derek Knight KP aero models 32mm 7.35KV brushless ducted fan running on 3 cells 11.1 Volt 320mA 25C Hyperion lipo cells obtainable from Robotbirds at about £8 each. I recommend the above lipo cells as they can easily supply the 7.8 amps required to fly this model at a very solid 130 grams thrust output. Blitzstürmer flew superbly in left hand circles using just one small celluoid trim tab on the rudder fin at the Ferry Xmas Frost free fly in and it even had a reasonable glide off power. Some minor dutch rolling was evident at times and I can only think that it may have been due to the powerful jet thrust causing blow back oscillations of the flexible trim tab surface as it circled into the wind direction . Graham Gostick thought otherwise and said he felt there was too much frontal nose profile area and that a larger fin area would probably resolve the roll issue. Alas, Blitzstürmer is no more as it has a broken back from a cack handed launch! I hope to build another one in due course with maybe just a bit more wing and fin area and some carbon in the fuselage for a stiffer unbreakable spine . Watch this space !